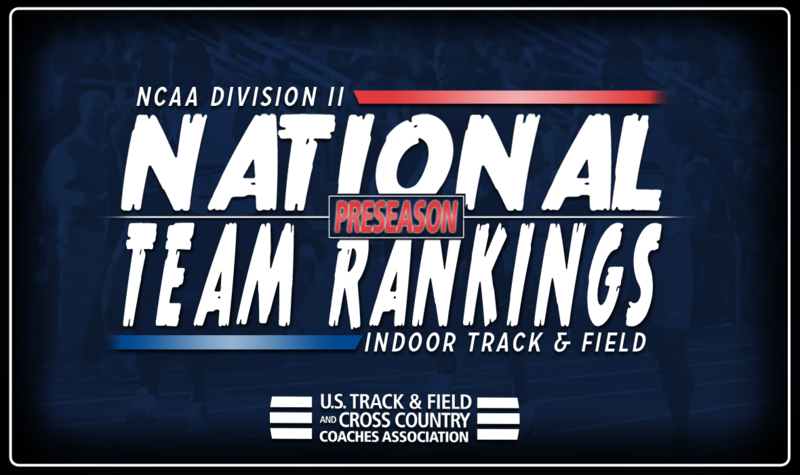 NEW ORLEANS – With the 2018 NCAA Division II Indoor Track & Field season set to kick off today, the U.S. Track & Field and Cross Country Coaches Association (USTFCCCA) has announced the NCAA Division II Preseason National Computer Team Rankings. Two teams that finished fourth at the indoor championships a year ago in Adams State (men) and Pittsburg State (women) lead the way in the initial rankings, while the defending national champion Tiffin Dragons and Adams State Grizzlies sit in second of the men’s and women’s rankings, respectively. This is the third time Adams State’s men’s program has been ranked first in the preseason poll, including last year and 2015. The Grizzlies captured their most recent national title during the 2015 season. Pittsburg State’s women’s team was also ranked first in the preseason poll last season. The 2017 national runner-up Ashland Eagles come in at third on the men’s side of the rankings and are followed by Missouri Southern and Minnesota State in fourth and fifth, respectively. Ashland’s ranking ties a program high for the preseason poll, while the latter two teams have never seen their names this high in a preseason ranking. The women’s rankings nearly mimic the men’s, as the national runner-up from a year ago in Grand Valley State also comes in at third. Behind the Lakers are West Texas A&M and Lincoln (Mo.). This ranking is unchartered territory for the Aggies of West Texas A&M, as its previous high-water mark in the preseason ranking was 12th. On the other hand, Lincoln’s ranking ties a program low. However, the Blue Tigers should not fret; the last time they started a season fifth in the rankings, they went on to win the national championship (2016). Rounding out the top-10 on the men’s side are GVSU, Azusa Pacific, Lincoln (Mo. ), Texas A&M-Kingsville and Pittsburg State. Azusa Pacific’s ranking is the highest it’s ever been since transitioning to NCAA Division II in 2013. Spots 6-10 in the women’s rankings belong to Findlay, U-Mary, Minnesota State, New Mexico Highlands and Hillsdale. Findlay’s ranking marked the first top-10 spot for the program since at least 2010. Past collegiate data is used to determine national preseason rankings in NCAA Division II. Subsequent rankings use only season-best, qualifying-list information from the 2018 season.